Book a Party BUS and Be Driven in Style Everytime! Sometimes….You just need a cool and hip bus to party in and that’s why Maxicabooking Singapore provides one of the nation’s best selections of fully loaded party buses across Singapore. Various companies operate at different level’s of party buses. Our party buses and limo buses offer amenities which include; custom lighting, seating for up to 13 passengers, high end sound systems and plasma / LCD TV’s. This ensures the quality of the bus you will receive will meet or exceed your expectations and provide your group with a safe and enjoyable experience. If you want to party in style you have found the best option with Maxicabooking Singapore Party buses serving the lower mainland and beyond. Party bus in Singapore get no better than us. 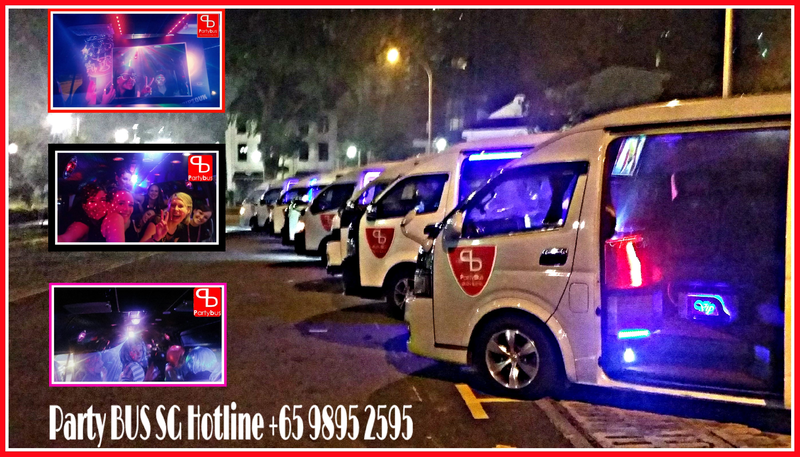 We offer multi stop service so you can pick everyone up and enjoy your Singapore party bus fully. Do not worry about having to drive and not enjoy your drinks, book a party bus with Maxicabooking Singapore and leave the driving to Us, so that what’s left you need to do is simply Party! Do not risk your perfect evening by engaging a cheap Party buses or Limos and end up stranded by a late arrival or even worse a no show. Our party buses will pick you up on time everytime, so you won’t be arriving late at your private or company events and takes you wherever you need to go and arrive in style like celebrities. Our party bus fleet are available for all occasions including; corporate events, weddings, proms, holiday parties, birthdays and just about any event or occassion you require party bus rental service for anywhere in Singapore. With access to more than 30 of these custom buses throughout our network, we have the bus you need at a price you can afford. Our high occupancy party buses presents an affordable and efficient way to travel to and from any destination, party, event or concert. We can pick-up and deliver guests from their residences directly to the front door of any venue. With party bus service from Maxicabooking Singapore you never have to worry about finding and paying for parking, walking long distances to events in bad weather, dealing with a designated driver situation. This way everybody gets to party! Remember that you get what you pay for when renting Party Bus services with MaxiCABooking Singapore. We owns and operates all our vehicles so we can guarantee you will receive the best customer experience possible. Many limo operators lease other company’s limos and have very little experience. We also maintains our fleet at the highest standards of quality, we are fully insured and we are constantly upgrading and replacing our fleet with the newest most sought after vehicles. This entry was posted in Party BUS 13 Seater Hotline and tagged book a party bus, need party bus now, party, party bus, party bus booking, party bus hotline, party bus singapore, party van, singapore party bus. Bookmark the permalink. ← Why rent a Maxicab and Minibus 6-13 seater passenger vehicle?